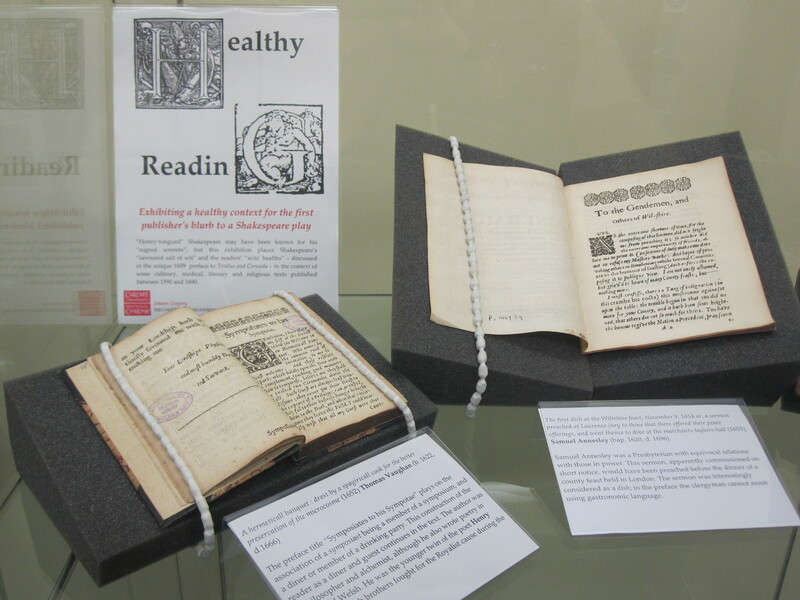 Following the success of the 1611 King James Bible anniversary exhibition, SCOLAR launches its first exhibition entirely curated by postgraduate students, as part of the University Graduate College’s Research Students’ Skills Development Programme. In February, Peter Keelan (SCOLAR), Alison Harvey (SCOLAR) and Jane Henderson (SHARE) held an RSSDP workshop on curatorial skills. Following this, three of the attendees volunteered to attend a second workshop, for which they planned, researched, and constructed their own exhibitions using SCOLAR’s facilities and equipment. The curators used SCOLAR’s rare books and printed sources to visually reflect and explore their research topics. All three students produced meticulously researched exhibitions to a professional standard on their chosen topic. See extracts from Healthy Reading by Johann Gregory (ENCAP), Divine Dimension by Corbett Miteff (JOMEC), and Approaches to Roman Archaeology in Wales by Jennifer Jones (SHARE). The exhibitions will be on display in SCOLAR during July and August 2011. “Honey-tongued” Shakespeare may have been known for his “sugred sonnets”, but this exhibition places Shakespeare’s “savoured salt of wit” and the readers’ “wits’ healths” – discussed in the unique 1609 preface to Troilus and Cressida – in the context of some culinary, medical, literary and religious texts published between 1590 and 1690. In SCOLAR, lower ground floor (until Wed Feb 16th).